I just went with my friend, Kristin, to a speaker event hosted by our shared alma mater, Wake Forest University. Carla Harris, a Vice Chairman at Morgan Stanley and Chair of the National Women’s Business Council, delivered a talk on her “Pearls of Wisdom”. Her talk was excellent, and she was very motivating. She had several career suggestions that I am going to try. She seems like she has it all figured out. Then there is me. Who doesn’t have it all figured out. Which leads me to tonight’s faux Rosh Hashanah question. Question: How would you like to improve yourself and your life next year? Is there a piece of advice or counsel you received in the past year that could guide you? I would like to spend more time in prayer, studying the Bible and communicating with God. While I have conversations with God in my head all the time, I don’t put a lot of time aside for prayer — deliberate praising, deliberate worship and deliberate asking for specific help. I have been much more actively engaged in our relationship in the past, and I know that I felt myself to be more calm, more relaxed and even more confident when I did. This year, I feel like I have been in survival mode most of the year. My prayers have all been about “help me”, “comfort me”, “relieve me”, and “guide me”. I would like to spend more time praying about other people, other problems, about learning, about growing, about next adventures, about how I can help others instead of others helping me. I love this picture. It hung over the dining table in my grandparents’ house, where we ate every Sunday lunch. Seeing it will always make me think of being with them and my family. The best advice that I received this year that will guide me in my journey is not new and is not complicated. It was simply, “Cristy, you don’t have to have everything figured out right now.” It took a little while for that to sink in. My first instinct when faced with my crisis (getting separated) was triage: Stop the immediate bleeding and then see how to return everything to as close to normal as possible. For me, that meant moving out quickly, buying a house quickly, asking myself questions about where I thought I would be in 3 years, 5 years, and trying to get everything situated just so as fast as possible. I was working myself into a tail spin. And then a couple of people gave me this really good advice. “Cristy, you don’t have to have everything figured out right now.” And when it did sink in, I was so relieved. The plan that I had for my life was gone. It was going to be different by necessity. But, it was ok if I didn’t have that plan sketched out now. Now, when my knees are still a little wobbly. Now, when I’m still learning my options. Now, when I’ve got more options than I had before. I can accept that having some questions left unanswered is ok, and it means that I spend less time calling on God to help me figure out my situation and more time enjoying what I have and those around me. I was raised in a Christian house. We went to church every Sunday. Whether my sister and I wanted to go or not (and there were lots of Sundays we didn’t want to go). I grew up in a world of Sunday Schools, Vacation Bible Schools, Bible Stories and such. I could quote lots of Bible verses and not just “Jesus wept” (John 11:35). That’s the shortest verse in the Bible, for any of you who maybe don’t know the Bible that well. I knew as a little girl that God wants us to pray. I had heard many times through my young life “…ask, and ye shall receive…” (John 16:24) and “….but in every thing by prayer and supplication in thanksgiving let your requests be made known unto God.” (Philippians 4:6). I had heard tales of people in dire situations who prayed to God for intervention and were rescued, people who had the faith that their prayers would bring about miracles and then the miracles happened. Asking in prayer and receiving was a common occurrence. I was also a child of the 1970s. The era of either really good or really bad TV, depending on your point of view. I was a big fan of Wonder Woman, starring Lynda Carter. I watched her show every week and dreamed of being a super hero, fighting bad guys and keeping peace. I wanted a pair of gold cuffs like Wonder Woman in order to save people, too. And with my unshakeable faith, I determined that I would ask God to give me some. 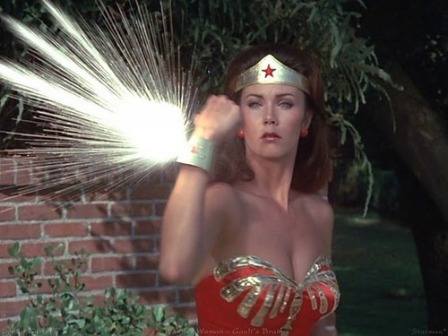 I prayed, and I prayed, and I prayed for a pair of Wonder Woman’s cuffs. I remember spending at least one hour before bed time one night praying as hard as I could that God would send me a set of my very own gold cuffs. And I knew that when I woke up the next morning they would be waiting for me. I was asking, so I would be receiving. The next morning, much like a Christmas morning, I ran downstairs into our den, quickly scanning the sofa, the floor, the chair, the side tables. No gold cuffs. I ran through the house, searching other rooms. No gold cuffs. And in retrospect, I have to admit, my faith in God’s willingness to answer prayers died a little that day. Could that be it? Did I fall trap to the fallacy that God answers prayers exactly the way one asks Him to? Even my childhood prayer for gold cuffs that would save people? Have I allowed my faith to have this tiny crack in it for all these years because I expected cuffs with red stars when maybe my people-helping cuffs are really my sense of humor or my willingness to lend a hand? I think that I did. I’ve had so many answered-in-a-different-way prayers. And this week, I learned that my gold cuffs were answered in a different way, as well. I’m finally comfortable calling myself Wonder Woman.